RJ-45 adapter or screw terminals may be used in either or both ports. Unit supplied with two screw terminal and two RJ-45 adapters. 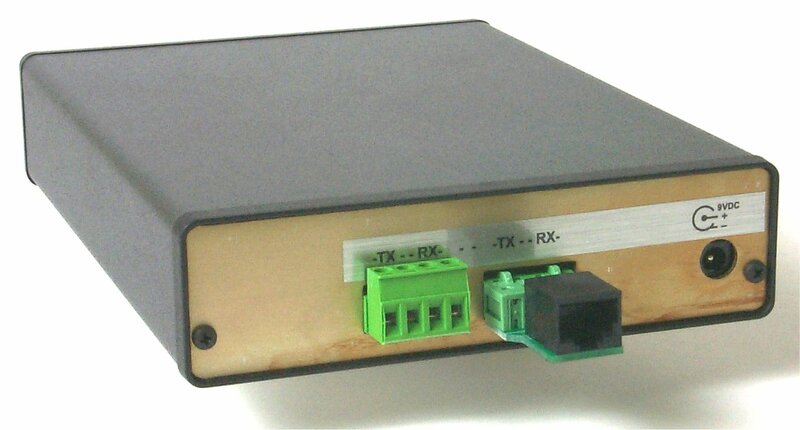 The DCB T-Extender is a 4-wire T-1 repeater for use on customer owned t1 lines. 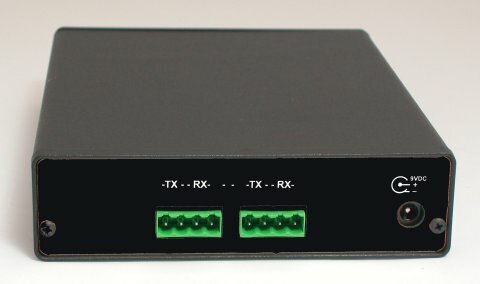 The T-Extender is a t1 repeater used to extend in-house T-1 lines in campus and high-rise environments. Note: This product is NOT intended for 10BaseT or Ethernet. T1 modulation is designed for use with twisted pair solid wire phone cables. The T-extender does NOT extend ethernet connections... only T1 connections. To extend ethernet 10/100/100BaseT cables, see our Ethernet-Extender here. Each pair of T-Extenders may be located up to 5000 feet apart. Solid copper 22 AWG two twisted pair is the preferred cable for connection between T-Extenders. Smaller wire sizes will reduce the functional distance between T-Extenders. Connection to the T-Extender is made through RJ-45 modular connectors or 4-wire screw down barrier strips. Both types of connectors are standard on the T-Extender. The DCB T-Extender is often powered by a small wall-mount transformer. 12, 24, -48, and 125 VDC versions are available. It is used to extend connections between T-1 equipment such as PBXs, T-1 multiplexers, T-1 line drivers, T-1 local multiplexers or any other T-1 equipment requiring long customer owned cable runs. T-Extenders may be used to connect this equipment across a campus, between floors of a high-rise office building or between office buildings with underground cable connections. While stand-alone units are most commonly used, a 1U rack mount is available that mounts three T-Extenders in a 19" rack. A 20 slot chasis is also available which contains up to 20 board-level T-Extenders and common power supplies. 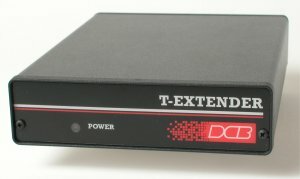 T-Extenders can also be used to extend the distance between any T-1 equipment (DSU, channel bank, router, etc.). Two twisted pair solid copper 22 or 24 AWG; standard telco T1 cable if UTP category rated cable is used, CAT 3 is recommended. We do NOT recommend CAT 5 cable. Although it often works well, CAT 5 cable has been shown to cause problems with many T1 installations. Other cable types will affect operational distance. Two connectors on the rear panel (A & B). These connectors are interchangable and each uses one of the following. Connect T-Extender transmit pair to the receive pair of the next T-Extender or T-1 equipment. T-Extender is not polarity sensitive. A cable cross-over is required between two Extenders if using straight RJ-45 cables. This cable connects the receive pair of one Extender to the transmit pair of the other Extender. Connectors A and B are electrically identical. Either one may be used as the "demarc" side or the "CPE" side of the Extender. Temperature: -40C to +70C Humidity: less than 95% non-condensing 7" x 5 1/4" x 1 1/2"
Many technicians installing T-Extenders for the first time don't have all the cables required to set up a pair of T-extenders and demonstrate that the T-1 line and other equipment operates properly on a work bench, or in the telephone closet. This kit includes all the parts needed to install two T-Extenders and the CPE within reach of the telephone company demarc, as well as a physical loopback RJ-45 plug to use diagnosing any problems that occur. Parts included are one T-1 straight-through cable, two T-1 crossover cables, two RJ adapter boards, and one T-1 RJ loopback plug. Solving T-1 Problems with the T-Extender This application note illustrates how to solve common T-1 demarc problems by using the T-Extender. The T-Extender is a no-configuration T-1 repeater/extender that allows a T-1 line to stretch 5,000 feet or longer. Read the application note here. One "To Telco" RJ-45 connector, One "To Customer" RJ-45 connector, and two screw terminal connectors are included with each T-Extender.